Pulitzer Prize-winning dramatist David Lindsay-Abaire's play Rabbit Hole is to get its UK premiere this Autumn in the West End. Pulitzer Prize-winning dramatist David Lindsay-Abaire’s play Rabbit Hole is to get its UK premiere this Autumn in the West End. Downton Abbey star Joanne Froggatt has been cast in the lead role of Becca. The play will run from 11 September to 22 November 2014 at the Vaudeville Theatre, produced by Creative Management and Productions, James Quaife and Celia Atkin. The play will be directed by Nigel Harman, who recently starred in I Can’t Sing! at the London Palladium, and previously starred in Shrek The Musical – which has a book and lyrics by Lindsay-Abaire. Harman is currently directing the national tour of Shrek. David Lindsay-Abaire’s play Good People is currently playing at the Noel Coward Theatre starring Imelda Staunton. The play’s design is by Tim Hatley, lighting by Hugh Vanstone and sound by Ben and Max Ringham. The original 2006 Broadway production of Rabbit Hole starred Cynthia Nixon, Tyne Daly and John Slattery and won the 2007 Pulitzer Prize for Drama. Lindsay-Abaire adapted his play into a screenplay for a 2010 movie starring Nicole Kidman. In the play, the life of a happy couple is traumatised by the death of their young son in an accident. 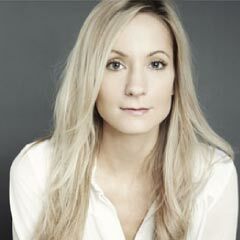 Joanna Froggatt’s stage credits include All About My Mother at the Old Vic Theatre in 2007.